2. Saute the garlic for 30 seconds. 3. Add the prawns and cook for 45 to 60 seconds. 4. Add the pepper powder, five spice powder, sugar and salt. 6. Cook till the prawns turn slight orange and start to curl up. 7. Switch off the flame and add lemon juice. 8. Stir to mix well and transfer to a plate. 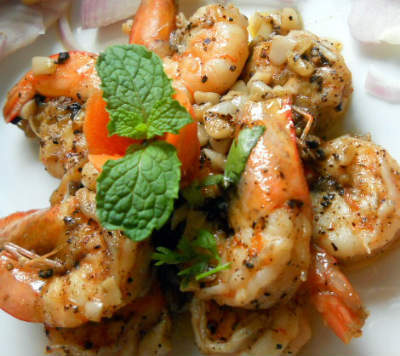 Feel free to comment or share your thoughts on this Garlic Pepper Prawns Recipe from Awesome Cuisine.